2019 The Astrophysical Journal Letters 872 L8. 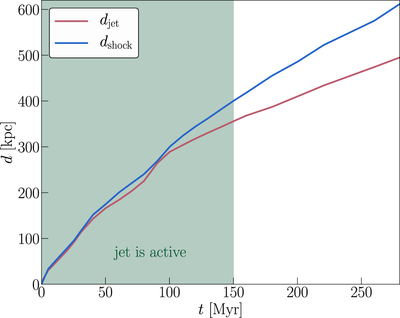 Cluster-centric distance of the shock (blue) and head of the jet and bubble, respectively, (red) as a function of time. After two-thirds of the jet lifetime, the shock detaches and propagates with almost constant velocity v ≈ 1670 km s−1 while the bubble rises with the slower buoyancy velocity v ≈ 1110 km s−1, which causes an increasing stand-off distance with time.